Dozens, and in some cases hundreds, of tiny needles are pressed against the skin, painlessly piercing its outermost layers. This method of “controlled injury” forces the skin to react by thickening and producing more collagen, the skin’s principle “stretchiness” protein. This increase in collagen production smooths the skin’s texture, filling in fine lines and plumping the skin. Over the course of a few years, Dr. Camirand started to notice that the tattooed pigment was completely dissolving and being replaced by actual melanin, the skin’s natural pigmentation. Furthermore, the scars themselves were showing a huge amount of improvement in texture, appearance, and color. This discovery led to the idea that puncturing scars with a tattoo gun, but without adding any color, could break down some of the tissues and materials inside them. This, in turn, would cause the scar to fade in appearance and naturally change color to match the skin’s tone. The results of multiple sessions were found to be remarkably consistent, with all of Dr. Camirand’s patients benefiting significantly from the treatment. Shortly after Dr. Camirand’s discovery, Dr. Des Fernandes, a plastic surgeon, introduced his own skin needling technique: a small needle stamp. He used the device to successfully stimulate the production of collagen in the skin. Dr. Fernandes presented his first paper on skin needling, specifically to treat the upper lip, at the 1996 International Society of Aesthetic Plastic Surgery congress in Taipei. As Dr. Camirand first discovered, creating tiny, controlled puncture wounds in the skin causes the body to respond by producing new collagen and elastin protein. Basically, the objective is to deceive your body into thinking it’s been wounded, which results in a thickening and overall improvement of the skin’s texture and appearance. With a lower risk of hyperpigmentation and scarring, it’s safer for darker skin tones than many other skin-rejuvenating options, particularly those that are laser-based. Some other treatments leave a distinct line between skin that’s been treated and the skin that hasn’t been treated. 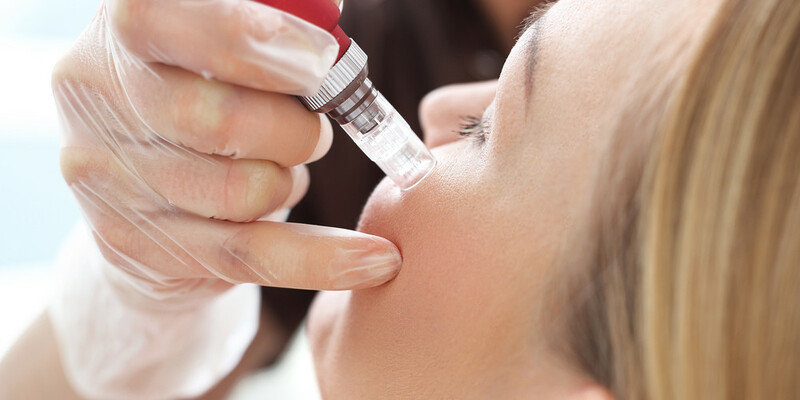 There’s no such line of demarcation with microneedling, meaning specific areas of scarring can be targeted without the need to “blend” the edges of the treated area. The needles used in microneedling come in a variety of lengths and sizes. All needle sizes inflict injury to the skin, but it’s the length of the needle and the corresponding depth of the wound that determines which condition it treats best. It’s important to know what each needle length is used for so you can make an informed decision when choosing one for your own unique goals. Cosmetic Needling — The shortest category of needles, ranging in size from just 0.1 to 0.5 mm in length, don’t penetrate deep enough to catalyze collagen production. 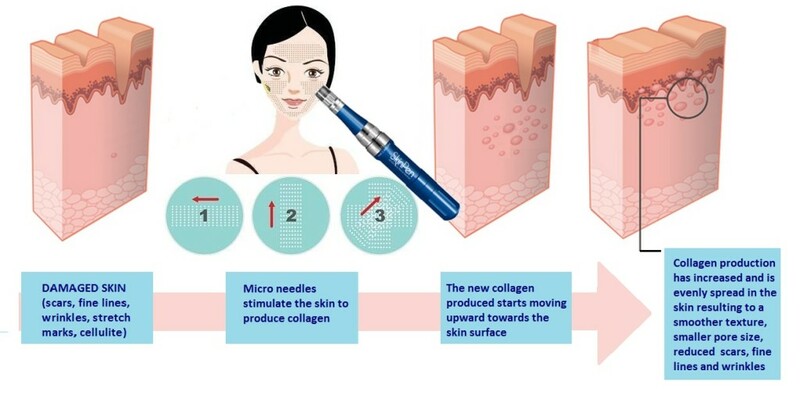 However, with this needle length no anesthesia is required, and you can even do this variety of microneedling at home. These short needles are ideal for treating superficial fine lines and wrinkles over time, as well as improving the absorption of topical creams and lotions. Medical Needling — With needle lengths ranging from 1mm – 2 mm, you can expect them to reach into the papillary dermis. This is the uppermost layer of the dermis, the layer of skin below the surface layer, called the epidermis. This means they can help increase collagen production. A local anesthesia is often used, and the procedure is performed on an outpatient basis. There are home tools available with needles this length, but professional care is advised. Surgical Needling — This is the longest category of needles, extending to 3 mm. This means these needles can reach all the way to the reticular dermis, which is the lowest layer of the dermis, or the subcutis, which is beneath the skin entirely. Surgical needling can’t be done at home, and requires a general or local anesthesia. What it treats best: Allows for better absorption of topical skin care products. This needle length isn’t long enough to cause an increase in collagen production. It’s useful to think of it as an exfoliator. Microneedling with a needle longer than 0.5 mm can be repeated safely every 4 to 6 weeks until you finally reach your desired goals. For collagen stimulation it’s usually recommended that you start with three treatments, separated by a minimum of 4 to 6 weeks. For reducing scars, an average of 3 to 6 treatments is suggested. Ultimately, exactly how many treatments and how long they will take will depend on how your skin responds to the procedure. Microneedling at home with a needle shorter than 0.5 mm is considered safe and remarkably painless. There is absolutely no downtime whatsoever, and you can even apply as much pressure as you’re comfortable with. When added to your usual routine, you can achieve impressive results by repeating 3 to 5 times a week. However, we recommend you first find out if at-home microneedling is right for you by consulting with a medical professional. 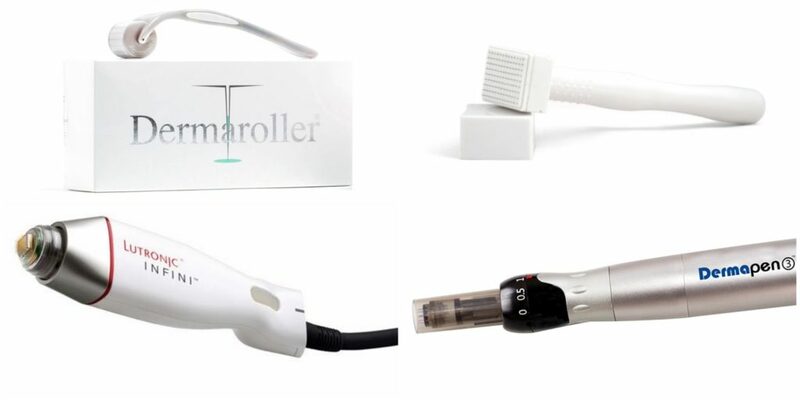 A microneedling roller is a very simple device. It’s a small, handheld tool that vaguely resembles a small rolling pin covered with needles. The pin is simply rolled over the skin, allowing the needles to break through the surface. This tool is better suited for treating large areas. There are both professional and at-home versions of this device. White Lotus Dermastamp – This brand is designed for use on smaller areas of skin that require strong stimulation. It’s perfect for isolated scars and hair loss. Pens are very similar to stamps, except they are motorized. Either battery-operated or plugged into the wall, these machines use a small motor to osculate the needles very rapidly. The movement is actually quite similar to that of Dr. Camirand’s tattoo gun. Dermapen – The world’s first microneedling pen is also a leading choice for both professionals and their patients. 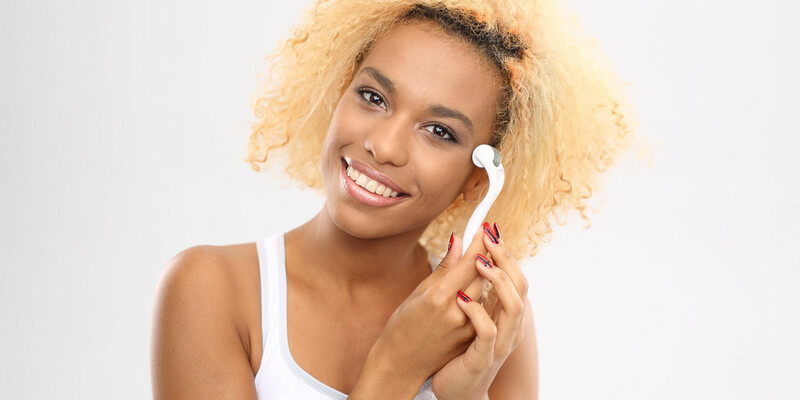 At-home microneedling presents numerous advantages. For starters, it’s a relatively inexpensive way to give you an instant glow, and over time it can help to plump, refine, and hydrate your skin. You might even notice your makeup going on more smoothly as your skin becomes more even in texture. In fact, the main benefit of using an at-home microneedling device is that it greatly increases the quantity of active ingredients from topical creams that are absorbed by the skin. It’s so effective at this that it can increase the absorption of some nutrients up to 90%, making it ideal for halting the early signs of aging and preventing new fine lines or wrinkles from appearing. Since at-home treatments are even less invasive than those performed in an office or medical spa, there’s virtually no downtime. You can do it an hour or two before going out to give yourself a pleasant glow. Remember to replace your needles frequently. Regardless of whether you use a roller, stamp, or pen, just like any razor, the needles will become dull over time. Dull needles are ineffective and increase your risk of infection. That means the more often you use them, the more often you’ll need to replace them. If you use your microneedles on a daily basis, you might need to change your needles as often as three to five times a week. If you don’t replace these dull needles you can damage your skin. Sanitize your needles before each and every use. This is essential to make sure you don’t spread harmful bacteria around your face or body. Start each session by cleaning your hands and face. Then, to minimize any chance of infection, dip your microneedles into rubbing alcohol to cleanse them. Be sure to rinse them off before using them; needling rubbing alcohol into your skin can be painful, irritating, and will absorb even more moisture out of your skin. Disinfecting your needles before and after each use will better ensure safe microneedling. Never microneedle over an acne breakout. Needling active acne can spread bacteria and cause a major infection. It’s better and safer to wait for your acne to clear before microneedling. If you’re going to try out a new serum, start with a patch test. The increased absorption that microneedling allows is incredibly beneficial. However, increased absorption can also mean excessive absorption of stronger serums, leading to irritation. To avoid this, just do a small patch test and wait 24 hours to see how your skin reacts. Don’t forget your neck, chest, and the backs of your hands. These areas are often overlooked, but they can also be some of the first places on your body to betray you with early signs of aging. Meet with a skin care professional before your first microneedling session. It’s best to do this regardless of whether you’re performing the procedure yourself at home or having it done at a clinic. This is most important if it’s your first time experiencing microneedling. This simple consultation will help you better understand your skin’s needs and how microneedling enhances its appearance. Stay hydrated. Drinking a lot of water isn’t only beneficial for your overall health, it also ensures your skin heals quickly, giving you that radiant, supple appearance. Microneedling can also rob your skin of its moisture, so drinking plenty of water before the procedure will help make sure your skin stays well hydrated. Begin and maintain a comprehensive skincare routine. Even though microneedling is minimally invasive, it will cause minor trauma to your skin, which is the point, after all. A comprehensive skincare routine not only helps to give your skin the strength it needs to endure the tiny punctures, it also makes sure you develop good skincare habits. After the procedure, you’ll likely be asked to apply certain topical products to aid with healing, so already having a good routine in place will help you stay on top of your aftercare. You should have a completely clean face when you begin treatment. Regardless of whether you’re doing it yourself at home or undergoing a professional procedure, the only lotion you can have on your face is a numbing gel should you be particularly worried about pain. Be sure to discuss this with your doctor prior to undergoing a professional treatment. Within the first day or two following your microneedling procedure, you’ll likely notice your skin starting to flake and peel. This is due to the treatment speeding up your skin cells’ turnover rate, which is how quickly the dead cells are replaced by new cells. Microneedling can make your skin sensitive to the sun. It’s best to avoid going out as much as possible for about 48 hours after your treatment, and use a strong sunscreen with an SPF of 30 or higher for at least 2 weeks after that. Even when you’re fully recovered, it’s a good idea to always use a sunscreen to improve the longevity of your results. Some people experience minor flaking (or peeling) a few days after their treatment. If this happens, it’s critical not to pick at your skin as doing so will inadvertently cause scarring or unsightly coloration changes. Either of these can result in more treatments than you had anticipated, or require an even more expensive and invasive procedure to correct the problem. Instead, use a gentle cleanser and a moisturizer until the flaking stops. Don’t apply any makeup for the first 24 hours after your treatment as it can increase the risk of infection. Furthermore, don’t apply any makeup with a brush during your recovery, especially if it’s not immaculately clean. The chances of infection after microneedling are small, but dirty brushes raise that risk. Avoid “active” skincare products. You doctor will most probably advise you agiants the use of any products that contain alpha hydroxy acids, beta hydroxy acids, retinol (vitamin A), or vitamin C (in a low pH formula). This will ensure your skin has the best healing environment possible. For the very best results, book repeat treatments 4 weeks after your initial session, and a series of 3 to 5 treatments in total. You’ll likely see some amazing improvements after just one session, but only by completing a full treatment cycle will you achieve your full goals. Despite this increase, most patients don’t see real, noticeable results for at least 1 to 4 weeks after their first treatment. Full results from the first treatment can take as long as 2 months to appear. While several treatments are usually required, you’ll likely see scar tissue shrink and a reduction of UV damaged skin, dark spots, and stretch marks after only one treatment. You may also see improvements in the texture of your skin as it grows thicker, firmer and healthier overall. Though the possibility exists, infections after microneedling are very rare. This is because even though there will be dozens, if not hundreds, of tiny little holes all over your face, they’re so small that they usually close up in less than an hour. You should still follow hygienic practices after your treatment, though. What’s the difference between a chemical peel and microneedling? On the other hand, there’s virtually no downtime after even the deepest of microneedling treatments. Microneedling merely pierces through the outermost layer of skin, rather than remove it entirely. This means microneedling carries a significantly lower risk of infection. What’s more, the increase in collagen that deeper peels offer can help plump up and thicken the skin, further helping to reduce the appearance of large pores. Again, each of these non-surgical treatments increases your skin’s natural production of collagen by creating micro-injuries to the skin. Both procedures work well to treat acne scars, open pores, pigmentation problems, or simply reduce the appearance of wrinkles. Of course, they treat these respective issues in very distinctive ways. Overall, microneedling is by far the more accessible of the two treatments, with far fewer risks involved. Be sure, however, to talk to your doctor to find out if it’s the right procedure for you. The shortest needle lengths shouldn’t produce any pain at all, and for deeper needles most practitioners provide their patients with a numbing agent. This allows them to go as deep as they need to with the needles. Often a collagen-stimulating product, vitamin C serum, and/or a skin lightener is applied to the skin’s surface. Then, using the microneedling device of their choice, the skin is punctured with tiny wounds, created in the uppermost surface of the skin. The speed and adjustability of the needles makes piercing the skin easier and increases your skin’s ability to absorb any serum that was put on your face. A vitamin C serum or hyaluronic acid is usually used after the procedure to re-hydrate, heal, and protect the skin. A useful way to think about the differences between at-home and professional treatments is to think about going to the gym. Hitting the gym by yourself and getting in a good, solid workout a few times a week is great for your body and general health. That’s similar to what using an at-home microneedling system is like. It’s easy, and you can see some pretty amazing results over a long period of consistent use. However, if you’re doing the wrong exercises or doing the right exercises incorrectly, you could be causing yourself more harm than good. On the other hand, going for a professional version of the treatment like going to the gym and working with a personal trainer. You get much more dramatic, longer lasting results, faster than you could get alone — and more effectively, too. Low or poor quality tools typically lose their effectiveness faster. If you did your research and purchased a high quality system, with proper care it should last at least six or eight months before needing replacement needles. Medical-grade needles won’t wear out as fast as their cheaper counterparts, but even they will eventually become dull and blunt, not unlike how even an expensive razor eventually loses its edge. That would depend on the severity of the problem you’re treating. If your skin is generally smooth and you care for it well, you can microneedle every 3 to 6 months to maintain your appearance. However, someone with dramatic acne scarring should plan on a session every month for 4 to 6 months to see the best results. After that, you can go in for a touch-up once a year, or microneedle as often as you feel your skin will benefit from it. Most people start to see results after their very first treatment. The benefits are remarkably far-reaching. For one, the tiny puncture wounds produced by the head of the tools greatly improve your skin’s ability to absorb topical skincare products and helps them work better.